Cockrobbinn had rather an important appointment recently and I was accompanying him. We were both dressed rather smartly and arrived at our destination half-an-hour early (anyone that knows us will soon tell you that we ALWAYS arrive early, wherever we go, or whatever we do, we are early – it’s a fault of ours). Now, what to do for half-an-hour? To a geocacher there is an obvious answer – tap on the app and see if there is a cache nearby. Simples. AND it was only 187m away from where we had parked. Off we trotted, pen in hand – a short walk down one road and up another and we arrived at ground zero which was at the junction of the second road and a main road, the latter being quite busy with cars slowing near us because of speed humps. By the way, I’m purposely not giving away where we were as it would spoil the cache for anyone following in our footsteps. Let’s just say it was a good half-hour drive away from Camberley !! We were underneath a huge tree and after poking around the base, behind it, to the left, to the right and in-between all the branches growing up from it, we were still no wiser as to where the cache was hidden. Being winter, no leaves cluttered our view but still no luck and time was creeping by. Just as we decided that we ought to head back for our appointment, I spotted something very craftily hidden – a black cord. Now there are not many reasons a black cord is hiding by a tree and as I excitedly looked closer I could see that there was a coil of cord and it seemed to be hooked onto the tree above my head with a brass ring. I released the cord from the tree where it was looped over a small branch and gingerly fed out the cord to see what would happen. I could feel something heavy but there was nothing in sight until Cockrobbinn, who was on the other side of the tree, shouted out that a huge bat was lowering itself on to his head !!! It was brilliant and the cache was a tube stuffed up its bottom !!! The bat was really high in the tree and only came down to head height but what a find. It took a bit of reaching as the tube didn’t want to come out so we had to unscrew it in situ, sign the log, capture the bat again and replace the lid – all whilst trying to appear nonchalant and innocent to the passing motorists and hoping no-one from the very close house didn’t come out to see what we were doing. Suspicious, or what ! Once the log was back in place, it was just a matter of hauling the cord in, hooking it back on the tree and hiding the evidence – ready for the next geocacher to find. We hurried to our appointment, covered in bits of twig and leaves and still smiling about the cache. I think the person we had the appointment with was ready to call out the men in white coats when we explained that we had just found a bat with a cache stuffed up its bum. She looked very unsure about it all and us; not a glimmer of amusement. Most definitely not geocaching material. Bats in the Belfry ?? It was the first time we had found a bat cache so a favourite point awarded. I do like it when an unexpected cache puts a smile on our faces. This entry was posted in Cache, Geocaching and tagged Bat, Cache, Caching, Geocaching. Bookmark the permalink. 2 Responses to Crocodiles, Dragons and now Bats !!! Being early is by no means a fault. I’m often early, in fact I really dislike lateness! 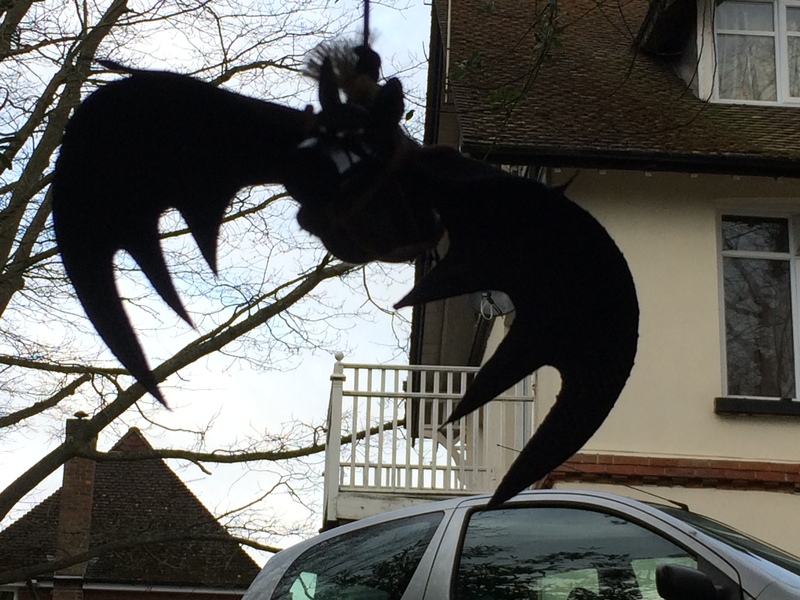 My daughter is batty about bats – she’d love this one! I have a vision of two smartly dressed people walking round and round a tree!! I haven’t met a cache like this, you were lucky to spot the cord.